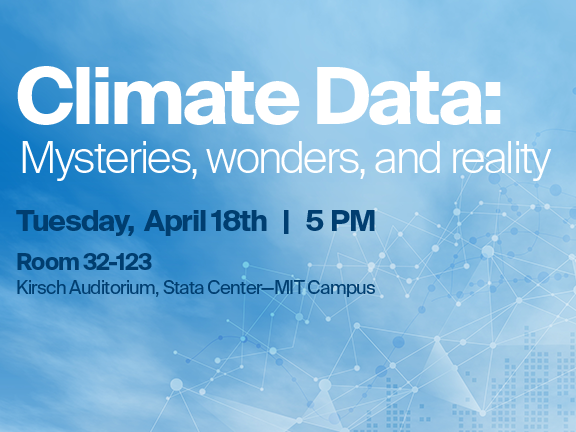 "Climate Data: Mysteries, Wonders, and Reality"
Climate data comes in a rich variety of quality with varying time and space resolutions. The mystery behind climate observations stem from the fact they require careful understanding of their limitations and usefulness. The wonder of all this data is being able to deduce changes and variations in the Earth’s climate from a surprisingly robust set of independent methods to reconstruct past and present climate from an exponentially growing set of data (approaching exabyte size --- 1018 or 1,000,000,000,000,000,000 bytes). This includes thousands of climate variables and diverse methods of processing these data. The mystery and wonder often come together as a not so glamorous nitty-gritty reality of trying to make sense of all the observations. Considerable scientific discourse is often necessary to develop and interpret data sets and models that help us understand the state and changing state of the climate system. A few examples of how this has evolved will be presented. This will include the data and methods used to deduce changes and variations in the Earth’s temperature and precipitation during the Anthropocene. If you plan to attend this lecture registration is encouraged. Thomas Karl received his B.S. from Northern Illinois University in DeKalb and his M.S. from the University of Wisconsin-Madison and was awarded a Doctorate of Humane Letters from North Carolina State University. After a brief TV/Radio weather forecasting position, Tom joined the National Oceanic and Atmospheric Administration (NOAA) in 1975. He held a variety of assignments in NOAA including Senior Scientist (1992-1998), Director of the National Climatic Data Center (1998-2015) and Director of the National Centers for Environmental Information (2015-2016). In 2010, he was asked by the President’s Science Advisor to Chair the $2.5b US Global Change Research Program’s Subcommittee on Global Change Research. There he was responsible for ensuring the delivery to Congress of an interagency Global Change Research Plan, Assessments, and annual Progress Reports for all agencies engaged in global change research. He continued in that position until 2016 when he retired from federal service after a 41-year career. He is now an Independent Scholar. The Henry W. Kendall Memorial Lecture Series honors the memory of Professor Henry W. Kendall (1926-1999) who was the J.A. Stratton professor of physics at MIT. Professor Kendall received the Nobel Prize in 1990 for research that provided the first experimental evidence for quarks. He had a deep commitment to understanding and finding solutions to the multiple environmental problems facing the world today and in the future. A founding member of the Union of Concerned Scientists in 1969, he served as its chair for 25 years. Prof. Kendall was deeply involved with arms control and nuclear power safety issues. He played a leading role in organizing scientific community statements on global problems, including the World Scientists' Warning to Humanity in 1992 and the Call for Action at the Kyoto Climate Summit in 1997. His publications included, "Energy Strategies: Toward a Solar Future" (1980), "Beyond the Freeze" (1982), "Fallacy of Star Ways" (1985), and "Crisis Stability and Nuclear War" (1988). He received the Bertram Russell Society award in 1992, the Environmental Leadership award from Tufts University's Lincoln Filene Center in 1991, the Ettore Majorana-Erice Science for Peace prize in 1994, the Award for Leadership in Environmental Stewardship from the Johns Hopkins Center for a Livable Future in 1997 and the Nicholson Medal for Humanitarian Services from the American Physical Society in 1998. The permanently endowed Kendall Lecture allows MIT faculty and students to be introduced to forefront areas in global change science by leading researchers.